BEIJING - Traffic snarled at major expressway toll gates across China before dawn on Sunday, as governments started to pilot a new policy to lift road tolls for passenger cars taking highways from midnight. Sunday is the first day of China's eight-day holiday bridging Mid-Autumn Festival on Sunday and the National Day Holiday from Monday to Sunday. Most expressways in the country are going toll free for passenger cars with fewer than seven seats during the holiday period. 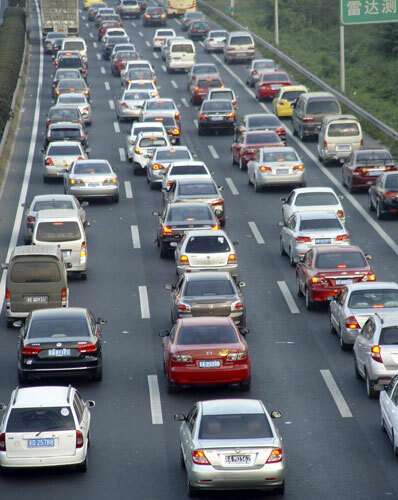 The Beijing Traffic Management Bureau reported long queues of cars appearing at 6 am on Sunday in front of toll gates for all 17 expressways in Beijing, as many outbound passengers hit the road before dawn. The bureau also recorded frequent road accidents on Sunday morning, incidents which aggravated the heavy traffic on many expressway sections. A driver surnamed Zhang said he was jammed on the road leading to the outbound toll gate of Xihongmen on the Beijing-Kaifeng Expressway, and he could not see the end of the long queue of vehicles. "Some cars even drove onto the hard shoulders of the roads," he said. At the Dujiakan Toll Gate on the Beijing-Shijiazhuang Expressway, police patrol cars used megaphones to keep waiting passenger cars off the emergency vehicle lanes. The toll gate tallied 17,000 outbound vehicles passing through from midnight to 6 am, which was four times the figure recorded during the same period of the previous year, when cars were toll charged. The bureau has forecast that the first and the last two days of the eight-day holiday will see traffic peak on the expressways. Meanwhile, in the southern city of Guangzhou, heavy congestion appeared in front of expressway toll gates as early as 10 p.m. on Saturday, when it took 50 minutes for a car to move 1,000 meters. Zeng Zhaokang, head of the Guangdong Provincial Transport Bureau, said many cars queued to wait for the holiday toll-free policy to come into effect at midnight. According to Zeng, the traffic peak occurred in the first five hours of Sunday. China's expressway toll fees are among the world's highest. The holiday toll-free policy has been hailed by many individual car owners for cutting a tremendous sum off their travel expenses. Zhang Zefeng, a driver in north China's Shanxi Province, said the holiday toll-free policy helped save 100 yuan on his journey home. "It is worth waiting for a while on the road to enjoy the toll exemption," said Zhang, who added he expects to see congestions. The traffic bureau in Shanxi dispatched over 1,000 traffic police to maintain expressway traffic order on Saturday night. The heavy traffic has caused consternation among many other drivers. Blogger Bing-bingliang posted an entry on Sina Weibo, China's Twitter-like microblogging service, suggesting that the government lift toll fees during ordinary days, and charge fees on holidays to avoid the expressways becoming virtual parking lots during these busy times.